Overall winner with 5 wins from 6 races was Hector Simpson, with Callum Dixon a worthy second on the podium, just 4 point behind and 7 points ahead of James Skulczuk in third. 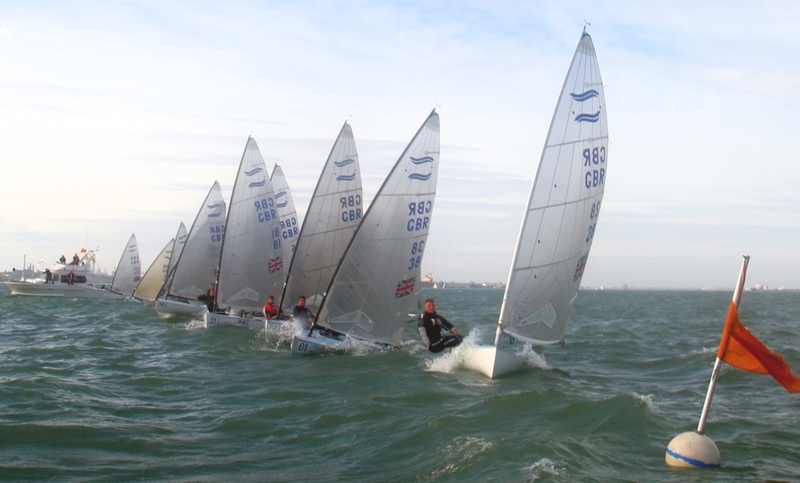 Counting as an RYA National Ranker event, Warsash saw the shoot out for the GAC Pindar U23 squad, with the top two in the Traveller Series each receiving £500 grants towards the 2019 U23 World Championships. Let’s hope World Sailing sees sense at their November meeting and keep the Finn as an Olympic Class to give these U23 sailors who have dedicated their futures to the boat the opportunity to fulfil their ambitions. With no other choice of Olympic class to suit their frames, it seems crazy to de-select a class that has produced more world class sailors across the whole of sailing than any other boat. With the worst of the storm further west and clearing through the South Coast on Friday evening. However, the low soon made it’s presence felt with a gusty southerly building as the race committee laid out a windward leeward course. Three races on Saturday set the pattern with Dixon winning the first race ahead of Simpson, who then took the next two races with some impressive drop pumping and surfing, with Dixon in second, James Skulcznk third and Cameron Tweedle in fourth. Heavy rain greeted the sailors for an early start on Sunday and a strong, cold nrtherly. Thankfully the 25-knots dropped a little for the first downwind, allowing the Masters fleet to stay upright and even permit a bit of ‘Dad pumping’, but they were no match for the athleticism and technique of the U23 lads who pulled out some big distances in their tight chases downwind. Over the final three races Simpson and Dixon continued to dominate at 1 and 2, with Skulcznk and Tweedle swapping 3rd and 4th places, while James Downer added a hat-trick of 5th places. Cameron switched boats overnight due to a minor problem with his new Devoti Fantastica hull, back to his older Devoti Classic. His results over the two days were identical – indicating that the perceived difference in performance between the two Devoti models may be just that. The overall season’s Travellers Series silver trophy was awarded to Cameron Tweedle, although Hector Simpson had closed the gap to a single points and James Skulczuk only a further point behind Simpson. Thanks were given to the excellent race team of volunteers plus Class Secretary Martin Hughes for organising the event and for not being diverted by off putting forecasts. Heading to your local sailing club for the weekend racing?